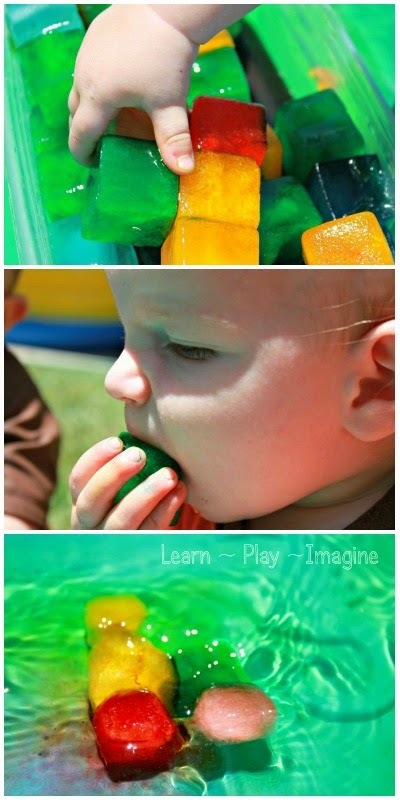 Last summer we enjoyed a variety of sensory fun in our play pool including using water beads, mixing paint, shaving cream, and water balloons. We had so much fun that I didn't even have a chance to write about all of our activities. I know it's still cool out in many places, but with summer just around the corner I wanted to post a few favorites from last year. 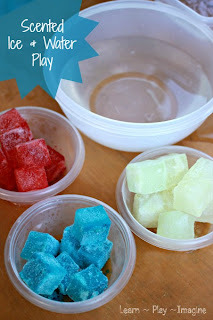 One of the most simple sensory play ideas for summer is playing with colored ice. Directions: I add the coloring to the ice tray before filling with water to get a more even disbursement of color. I used food coloring instead of liquid watercolors, because I knew they were likely to taste the ice. I try to plan ahead and make colored ice the day before I want to set it out for play, so it is good and solid when we are ready. In fact, during the warmer months I almost always have colored ice or frozen paint in my freezer. It drives my husband a little crazy, but he loves me and puts up with it. My twins had just turned one when I set up this invitation to explore colored ice in the play pool. I filled the pool with water then put the container of colored cubes inside the water. 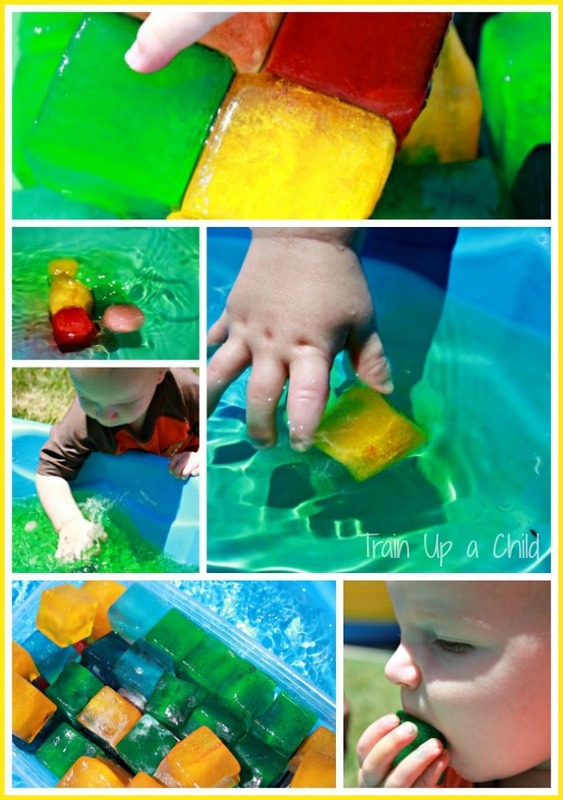 When I set up water play for babies or toddlers I never put them into the water. I wait until they show an interest. Some children feel vulnerable in water, especially cold pool water. Peanut surprised me by splashing around immediately and reaching for the ice. He is usually more cautious with water play. He loved dropping ice cubes into the play pool and watching the changing colors as the ice melted. 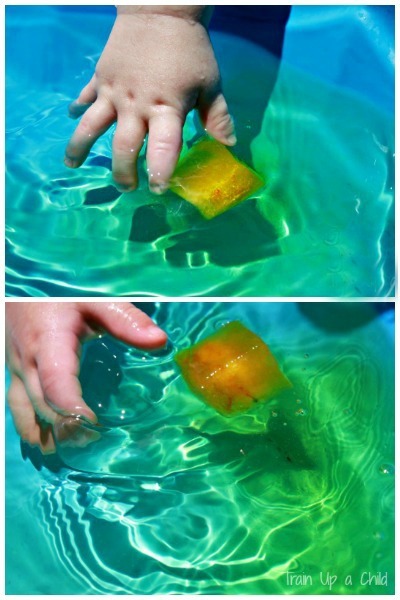 Playing with objects in water is a great activity for tracking and developing fine motor skills in young children. No surprise here, Tank was more interested in tasting the ice. I hope it goes without saying to never leave young children unattended near water. When our play pool is filled with even a small amount of water our children are supervised at all times. Peanut splashed all afternoon in the newly green water. For more baby sensory play follow me on Pinterest. Ok, so dumb question, but how exactly do you make your colored ice? I tried it once before using muffin tins, and the color all froze in the middle of the "puck" of ice. I figured it had something to do with alcohol-based food coloring freezing at a lower temp or something, but...?? Not a dumb question! Did you add the food coloring first or last? When I add the food coloring after the water I don't get even color, but when I add the food coloring first it works well. I use silicone ice cube trays. I'm not sure if that makes a difference. This looks so fun! It's not quite warm enough to do an activity like this, but in a few weeks when it warms up, I'm definitely doing this with my kids. They love water and colored water will make it even more fun! Okay, I'm thinking of doing this tomorrow with some kids I'm babysitting and I have to ask a stupid question: DOES FOOD COLORED WATER DYE THE CHILDREN? And does it dye the pool? :) Thanks! Not stupid :)- Temporarily yes, but it usually washes clean by the end of the day. Red takes the longest to go away. My kids often have stained fingers for a day. It did not stain my pool and has never stained any of my containers when we've played with water/ice/containers. If you have liquid watercolors they wash clean sooner, although they still sometimes last for the day.